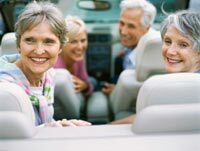 “When did it become hard to get in and out of my own car? I didn’t see that one coming!” You never do. Well, that’s not true. Sometimes a catastrophic event alters mobility in the blink of an eye. But, all too often, the slow erosion of dexterity is a creeping, subtle culprit. 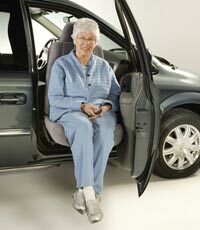 One day, the normal twisting, turning, or climbing required to get into and out of a vehicle becomes a challenge. 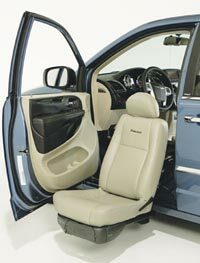 Learn more about Bruno's line of Valet® Signature Seating or find a Valet seat for your vehicle. Valet® - What is it? 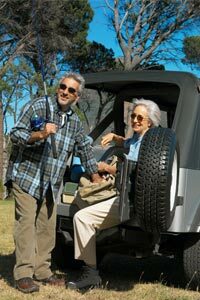 Bruno introduced turning seat solutions to the US market in 2000 and continues to be the market leader. 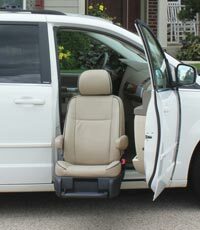 Includes a high quality, Comfort Seat/Armrests and utilizes the factory seat belt. 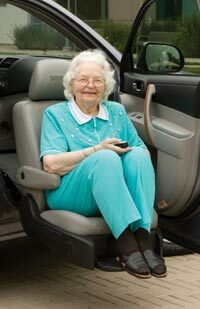 Meets or exceeds all applicable Federal Motor Vehicle Safety Standards (using the factory seat is not recommended or approved by the car manufacturers due to crash testing and many safety reasons). *Application list is constantly growing. Contact Bruno for details on specific model year, model and compatibility. Important Note: Confirm all applications with an authorized Bruno dealer This product was formerly known as the Turny™ or the Orbit Call Scott Weeks at 800-657-5438 for more information. The Valet® Plus - What is it? Fully powered operation; can be stopped at any point for ideal transfer height. Easy one button operation with intuitive display window on hand-held pendant. 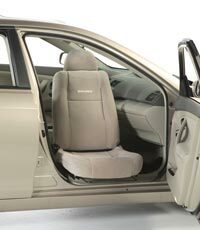 Includes a high quality, Comfort Seat/optional armrests and utilizes the factory seat belt. Full seat recline (with easy recline lever located on both sides of seat). Dealer programmable for optimal path and maximum legroom. Fast and simple manual backup system. No structural modifications to your vehicle - will not affect resale and can reinstall in your next vehicle*. Hundreds of vehicle-specific mounting kits provide a safe and precise installation for minivans, SUVs, pickup trucks, CUVs and full-size vans - first and second row applications available (check with your local Bruno dealer to confirm compatibility with your vehicle). Wide variety of seat options in Metro Tech fabric or Ultraleather™ Plus. A Bruno Vehicle Lift complements your Valet Plus for a total mobility solution. *Application list is constantly growing. Contact Bruno for details on specific model year, model and compatibility. Important Note: Confirm all applications with an authorized Bruno dealer Call Scott Weeks at 800-657-5438 for more information. Valet® Limited - What is it? Bruno's Valet Limited is a premium, beautiful passenger seat that is the definition of style and substance. 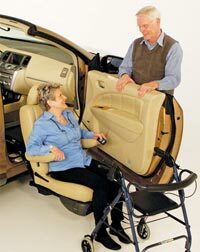 Not only does the seat rotate with smooth efficiency, it automatically reclines as it moves through the door frame, providing extra head clearance. This "tip of the hat" recognition of your comfort is an indication of a seat that will make your travel experiences memorable! Seat material selection includes: Standard black pattern fabric and a wide variety of options in Metro Tech fabric or Ultraleather™ Plus. For Toyota or Lexus vehicles, we are able to color match the leather of the original seats. *Contact Bruno for details on specific model year, model and compatibility. Valet LV - What is it?